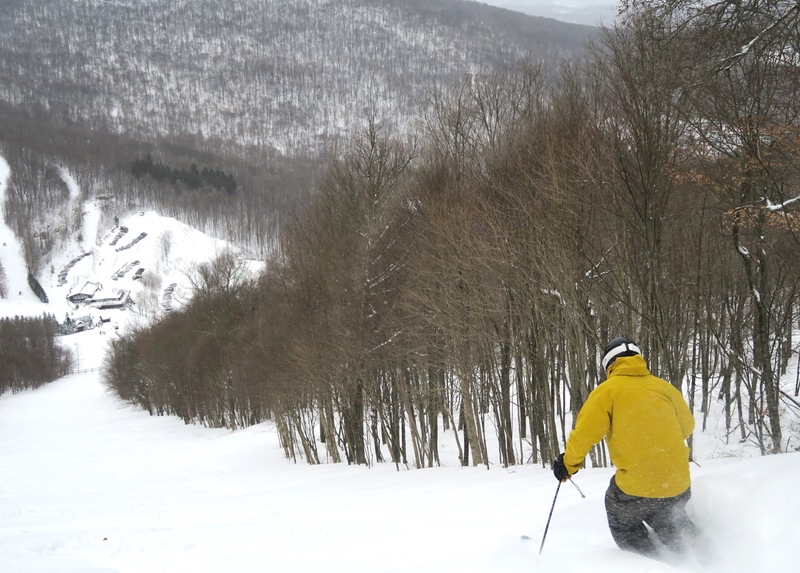 For the second time in nearly 25 years, Plattekill opened the season with 100% terrain and all natural snow. If you were there, it sure felt like an historic occasion. I set my alarm for 4am, Catskill Standard Time. As soon as I looked out the window, I knew I was on the wrong side of the clock. There was an inch on my car and it was snowing hard at 20 degrees. When traveling to Plattekill, my goal is to arrive by 8:10. This gives me a chance to say hello, and still make first chair. Realizing that snow in the flatlands would add time to the drive, I left at 4:30 am, even earlier than planned, to try to make up some time. As I drove north the temps were steady, around 20 degrees. I guess I was coming up from the south with the storm. The Thruway was much worse than Route 28 into the mountains. There wasn’t too much traffic on the state route, and I used the double lane up the hill into Highmount to get by a super cautious driver. When I passed Belleayre, it was 24 degrees and some sleet was mixing in, banging against my windshield. It was snowing hard and the wind was ripping when I finally arrived in Roxbury just after 9am. I was booted up and on the lift in under fifteen minutes, a personal record. Attached to my coat was something I will save: a Plattekill lift ticket for opening day. Under the triple there were plenty of spots where manmade snow was piled deep. But those whales were buried under a soft blanket and we never really touched any manmade with our skis. The snow on that side was windblown. The easiest way down for me involved some serious tail gunning, although I did actually pull off some tele turns. Sundown was more wind-protected, with only three tracks before me, a big fun first run. I found Scottski and Mogul Junkie. They were pursuing the terrain off the double before it was spinning. 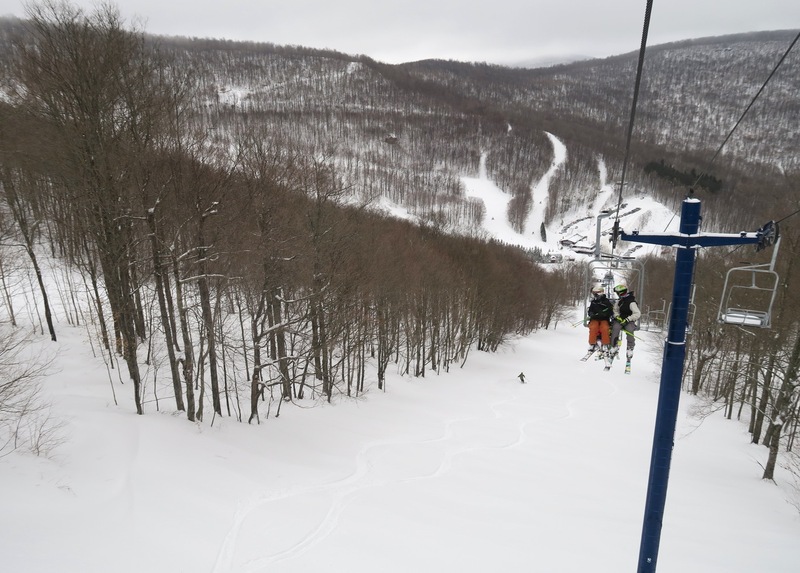 I love to ski with Plattekill fanatics heading out beyond the available lift served terrain. There were first tracks everywhere. On Blockbuster the snow was much easier, on far skier’s right the snow was dreamy creamy. Overlook, Ridge Run, Twist and The Cliffs; I must have hit The Cliffs six times. 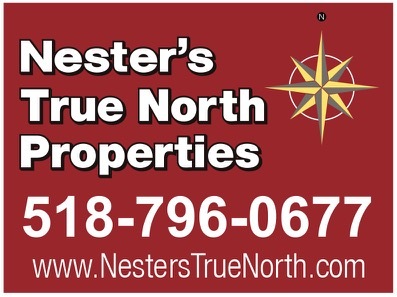 I hucked and landed, with nary a thought, easy and fun. 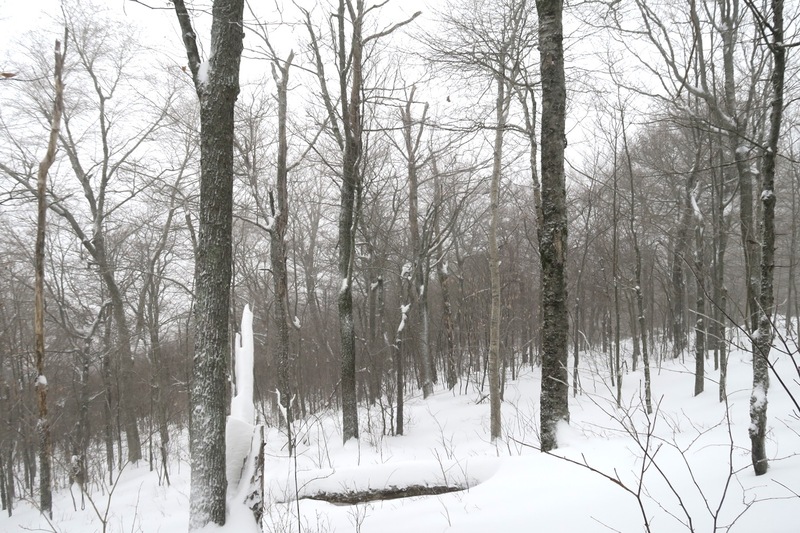 For me, in the end, the snow was SO GOOD on the trails, I’d didn’t feel jumping into the trees was necessary to sustain my massive $hit-eating grins. So there you have it. It was all open, on all natural, and there was so much skiable terrain that there were fresh tracks well into the afternoon. All day long, if you were in the trees. On opening day. Later, in my favorite bar in Delaware County NY, my friend Ace used the word authentic. The word has meaning that extends beyond “real.” The day was classic Plattekill: unreal and throughly authentic, all at the same time. cool dude, Harvey. good seeing you and that was a blast for sure! Nice. How did the hill do business-wise that day? Wish I could have been there Harv…nice living vicariously through you once again. What an historic day for sure! During the tortuous 5.5 hr drive up I thought more than once about turning around but I am so glad I pushed through. Barely hit bottom even in the trees! Everyone had that same grin on their face when they realized how much they scored! Let’s hope this is an indication of the season to come. I guess I missed out big time. It’s 60’s and 70’s in the deep south. 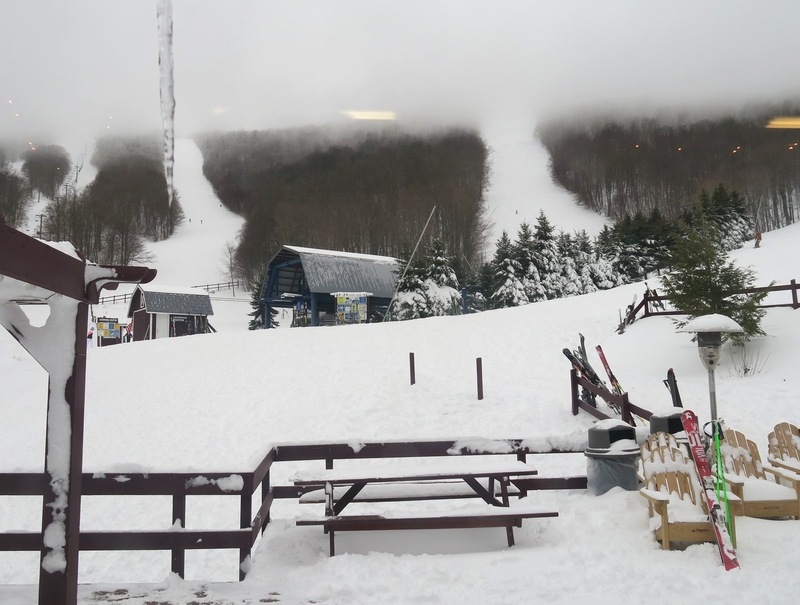 #Jealous #nosnow 🙁 so, the take-aways are: PlatteKILL(s) = Fresh snow, no lines, fresh tracks, “dreamy creamy” sounds like a line from a Monkees song, dude! Nice piece, Harv. 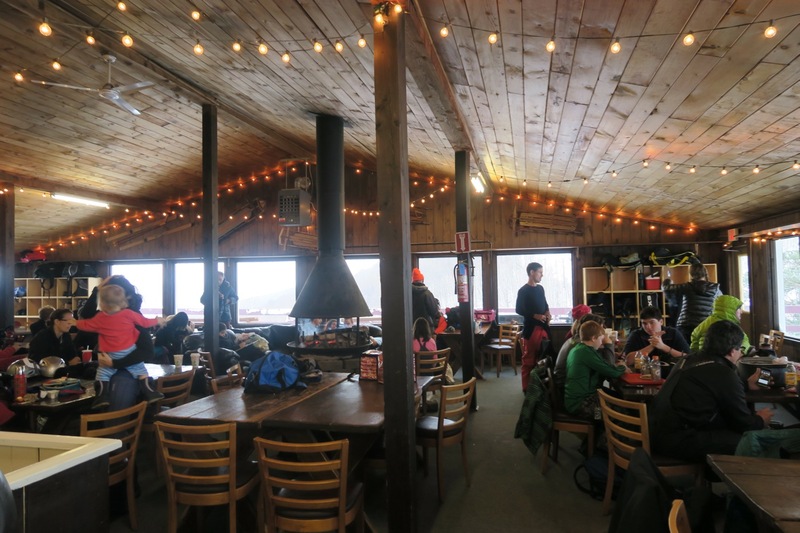 The lodge photo… it looks to have a similar vibe to Prospect Mt. Happy New Year. @Jamesdeluxe: I would say the customers were extremely satisfied.